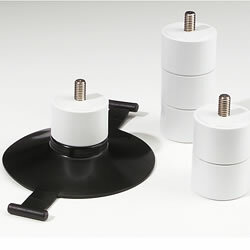 1" Height Adapters for up to 3"
Height adapters, adds up to 3" additional inches to base plate, order in 1" increments. 400C-A15170 must be used for the first inch (w/adapter plug). 400C-A14694 for additional inches, 3" maximum (1 - A15170 and 2 - A14694). Each inch comes in a set of four.